Nestled in Costa Rica’s Guanacaste region, Tamarindo’s climate is mostly hot and dry. Temperatures are pretty consistent year-round, between 80 F and 90 F. During the “dry” season, which spans November to April/May, the sun shines and skies are clear every day. During the “rainy” season, which technically begins in late May and rounds out in November, it’s realistic to expect the occasional afternoon shower with a day every now and again of extended rains. The bulk of the rainfall in this area typically comes during September and October. Should you choose to retire in Tamarindo, you’re guaranteed ample Vitamin D during your golden years. Costa Rica in general has been hailed for its accomplishments in healthcare. You have the choice between private healthcare, in which you have the option to pay cash, or purchase health insurance—and the public system, known as the Caja (Costarricense de Seguro Social) which is available to all legal residents. Payment into the Caja is dependent on income (typically a monthly fee between 6% and 12%) and many private insurance companies offer excellent coverage for low premiums (about $1,500 per year). If paying in cash, you can expect to spend $50 to see a doctor and $80 for a specialist. Most major surgical procedures run at about a third of the cost offered in the U.S. In Tamarindo you’re about an hour’s drive from the nearest hospital in Liberia, but there are multiple doctor’s offices, emergency clinics and dental offices located conveniently in town. A typical cash payment for a dental exam and cleaning is about $60. While Tamarindo will still offer an exotic, small town feel, you will have access to many modern amenities that you may not find in other Central American beach towns. Each of the major bank chains in Costa Rica have a branch in Tamarindo, along with several local grocery stores. You also have access to services like photocopies/scanning, printing, public notary, and expat specialized tax services. You can shop at the local market and cook at home if you choose, but if you feel like eating out, you’ll have access to a wide variety of local and international cuisine at any of the restaurants which line the main roads in town. If you have family and friends back in the U.S. or Canada, you’re only about an hour’s drive from the Daniel Oduber Quirós International Airport in Liberia, where there are a growing number of daily flights to North American destinations. You’re also only about two hours south of the Nicaraguan border at Peñas Blancas, and flights to numerous other Central and South American destinations are convenient and affordable. While Costa Rica is often praised for its friendly people, there’s an added bonus in Tamarindo. Not only are locals welcoming and friendly, but the surf town has truly blossomed in recent years to become an international melting pot with a thriving expat community. Where the expat community was once comprised mainly of North Americans, you’ll now find people living and operating businesses here from all over the world. From organized ladies’ nights, to family style dinners to celebrate holidays, expats here understand what it’s like to move somewhere new, and thus are always welcoming newcomers to help make that transition a smooth one. While firm numbers are not available, it’s estimated that about half of Tamarindo’s full-time population is comprised of expats. Most expats report being able to live in Tamarindo on $2,000 per month or less. While rent prices widely vary, you can find humble accommodations for well under $1,000 per month, and if you have a bit more wiggle room in your budget, Tamarindo also offers plenty of luxury living options drawing an eclectic mix of people from all walks of life. While imported goods can be a bit pricey, expats love access to fresh food grown locally, and they love the prices too. The walkability of this town certainly helps many expats keep their monthly budgets down as well. If you live close to town, you can walk pretty much anywhere, and when needed bus transportation is highly accessible, reliable, and inexpensive for out of town destinations. For example, to go to Santa Cruz (the local municipality center) would be $1.30 and a bus ride to Liberia (nearest international airport) will only cost $2.50. Local taxis are readily available usually anywhere between $2 and $4 in and around town and along the outskirts. In terms of entertainment, people save money because many of the things they love to do here are free; swimming in the ocean, walking along the beach, mountain biking, hiking, etc. 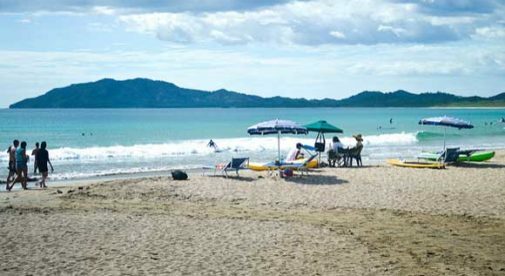 Arguably the most developed beach town along Costa Rica’s northern Pacific coast, Tamarindo offers many of the benefits of a modern city. But while you can enjoy a day of shopping followed by a nice dinner out in town, you’re also steps from nature in any direction. Howler monkeys serve as many people’s daily alarm clocks. Most people who live in town are also just a short walk to the beach. And Tamarindo Bay is hugged by rolling hills and mountains; perfect for exploration. The hills in Tamarindo are a haven for bird watcher’s too, with daily opportunities to spot tropical feathered gems. While typical Costa Rican food is fresh and delicious, Tamarindo can also fulfill the appetites of those looking for something a bit different. Along with the melting pot community that’s been cultivated here also came a variety of international cuisine you may not expect to find in a Central American beach town. From authentic Italian and Mexican, to fine steakhouses and seafood masters, you can find pretty much anything you might crave here. While Tamarindo has certainly grown in recent years, it remains a small town at heart. And with a two-mile stretch of pristine beach, the town is developed and laid out to hug the bay, meaning that no matter where you live in town, you can walk to the beach. When comparing rental prices and proximity to the beach, you’ll be able to live closer than you may have ever imagined and still maintain an affordable lifestyle. On the checklist for most expats when searching for a place to live in Tamarindo is a guest room, and for good reason. Probably one of the greatest fears in retiring abroad is missing your loved ones, and thus kicks in the desire to go somewhere you’re confident they’ll come and visit. With affordable and convenient flight options into Liberia, and Tamarindo’s global reputation, you’ll never be short of visitors coming to stay.